Ida Bernice Grane, age 91, passed away on Thursday, March 21, 2019 at the Sanford Hospice Cottage. Funeral services will begin at 11:00 a.m. Thursday, March 28, 2019 at Redeemer Free Lutheran Church, Canton, SD. Visitation will be Wednesday from 2-7 p.m., family present 5-7 p.m., at Anderson Funeral Home in Canton. Bernice was born January 3, 1928 near Canton to Ole and Inga (Holdahl) Homandberg who were both immigrants from Valdres Norway. She attended Sunnyside District 5 country school and graduated from Canton High School in 1946. She was baptized and confirmed at Canton Lutheran Church. A highlight of her life was an extended trip to Norway with her parents in 1947. She married Earl Parkinson and lived in California, Seattle WA, and Okinawa. In 1965 she married J. Gordon Grane and became a full time farm wife and mother. She was financial secretary with various employers, including Lockheed, Farmers State Bank, and Canton Lutheran Church. She was modest regarding her artistic gifts, especially oil painting and rosemaling. She enjoyed reading and sewing both clothing and quilts. Bible study was a passion of hers. 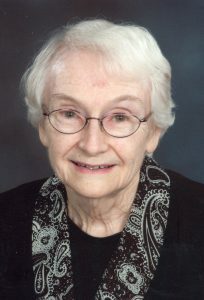 In later years she was a Stephen Minister and was a volunteer Bible Study Leader at Hiawatha Heights Assisted Living. Grateful for sharing her life are her children Suzanne (Nathan) Anderson of Sioux Falls, Eric of Canton, and Leif of Corona, CA; grandchildren Samuel (Marlea) Anderson, Katelyn (Jason) McGee, Isak (Crickett) Anderson, and Joseph Anderson; and 9 great grandchildren: Kiara, Owen, April, Ivan, Julian, Anika, Kaliyah, Azalea, and Ace. Bernice was preceded in death by her husband J. Gordon Grane, her parents, her sister Olga Espeland, 3 infant siblings, and a niece Diane Tipple. Our thoughts and prayers are with the Grane and Anderson families. Family of Bernice: “Do not grieve that she passed away, but celebrate the days she passed your way.” My sympathy to the family of Bernice. I would like to introduce myself: I’m Janis (Rikansrud) Campbell of Emmetsburg, IA. My parents were Cliff & Olive Rikansrud and good friends of Gordon & Bernice. I took organ lessons from Dennis Espeland at Canton Lutheran and Diane (Espeland) Tipple was a classmate and friend of mine. We graduated from Canton High in 1964. It is a very small world because I played for Bernice’s and Gordon’s wedding in April 1965, and have pictures of myself at the organ at Canton Lutheran and I know that it was the first wedding that I played for!! I am still an organist at Bethany Lutheran here in Emmetsburg, IA. Bernice was such a gentle and quiet lady. May God Bless Bernice’s memory. She will be greatly missed.Take comfort in knowing she is with the rest of her family.Angels are watching over her.Thoughts and prayers to all your family. Our thoughts and prayers are with you at this sad time. Be assured in the promises of our Lord.